now happening all weekend at The DIY Club! A new etsy feature and giveaway starting each Friday and going all weekend long. What's the giveaway this week? The sweet bird pin cushion (photo above) from the etsy shop of Gina at The Shabby Chic Cottage. Have you taken the 2011 Hand Built Pledge? I have! Read all about it and link up to pledge over at The Design Confidential! 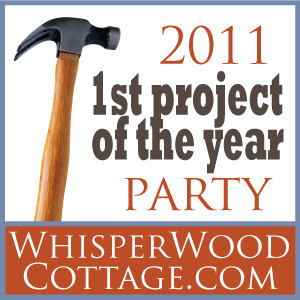 Deadline to claim prizes for the 1st Project of the Year Party is January 31, 2011. Check the links below to see if you won or were featured. If you won a prize, please email me before the deadline to claim it. I so enjoy reading your blog. Thank you ever so much for featuring my abacus project as part of your 15 must see features. It was so much fun to make and I'm grateful to have the opportunity to share the results. Happy weekend! !